Do y'all ever use the TimeHop app or check on the "On This Day" feature on Facebook? 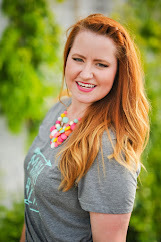 Sometimes I'm reminded of sweet memories of my time on social media, but other times I'm left confused or cringing over the ridiculous stuff I've posted over the last ten years. Today turned out to be one of the sweeter days. As it turns out, five years ago today, my husband and I closed on our house and moved in that very night. We were so excited to be first-time homeowners; we piled in with some duffel bags and an air mattress. 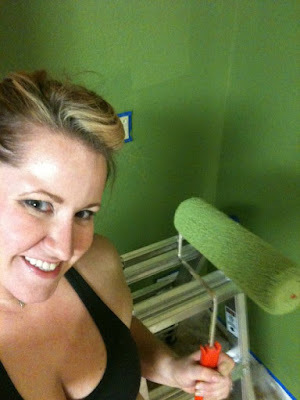 We ate pizza on the floor and stayed up late into the night painting our kitchen "Jalapeño Green." I found this little gem in my TimeHop, and wanted to share it with you! We have such sweet memories in this little house. This is where we've learned to be grown-ups (sort of. Adulting is weird). We brought both our babies home here, and we're having the time of our lives watching them grow up here. We've hosted dozens of parties and get-togethers with wonderful friends. We've painted every room at least twice. We've both fallen down the stairs at least twice. This house sat empty for a few years, no one ever living in it, before we bought it and made it our home. I'm so grateful for every square foot! Here's to many more years with you, little house! In honor of our Fifth House-iversary, I've updated our Home Tour here with new photos of the finished kitchen, as well as photos of my littlest girl's room, and a few others. Please go check it out! I am working hard to get other rooms in good shape so that I can photograph them and share them with you too. In other business, I have one more bitty kitchen update to share. I know I have talked a lot about this little kitchen lately, but all my efforts have been laser-focused on it for months! Plus, I felt like I couldn't start decorating for Christmas until I had these little piddly projects finished first, and Christmas is serious business! 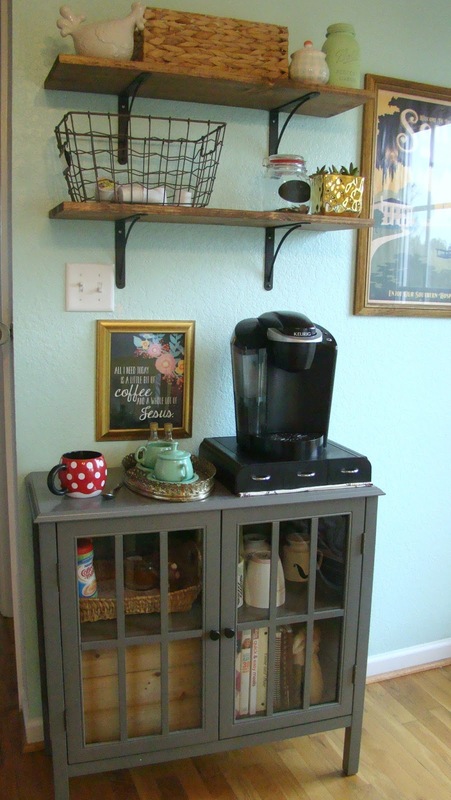 So a few weeks ago, I mentioned that I wanted to create a small coffee bar to house our Keurig and coffee-related accessories. For as long as I've been married, I've been using this old baker's rack as extra storage in my kitchen. It was a hand-me-down from my mom, and it's easily twenty years old. It's not a bad piece, but It's not exactly my style, and the wire shelving made it difficult to set anything small on them. Plus, do you see the light switch behind it?? We had to reach through the shelves to turn the lights on and off. Not functional. I had a narrow space to fill, because the door to the back deck opens directly to the right of the baker's rack. I'd searched antique stores and thrift stores and scoured websites for the perfect piece that I could either refinish or buy. I was having a hard time finding anything that fit my taste, space, and budget, and I seriously considered building my own. 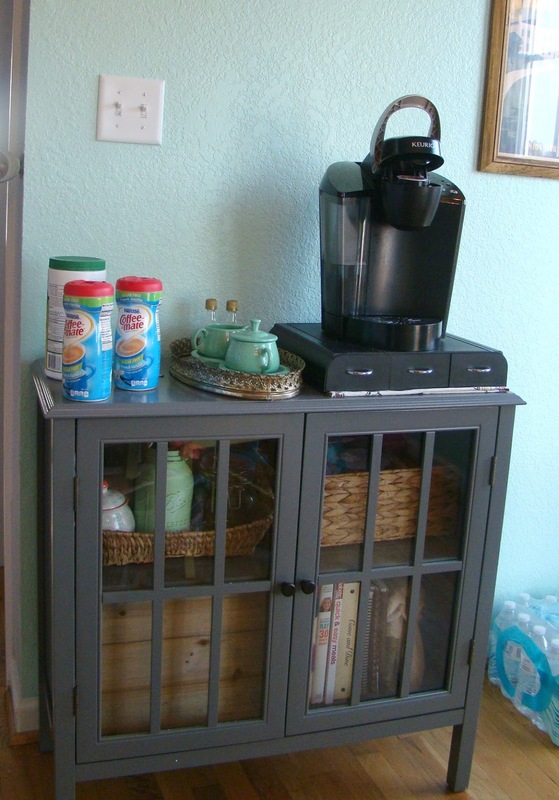 Then I saw that Target was having an online sale on their furniture, and this cabinet was on sale with positive reviews and free shipping! With my online coupon, I got it for almost 40% off, score! It fits the space perfectly, and I loved the color and doors. It was worth what I paid for it, since I didn't have to do any work to it whatsoever. Here it is right out of the box with our stuff just haphazardly arranged. It was very simple to put together, and is very sturdy. 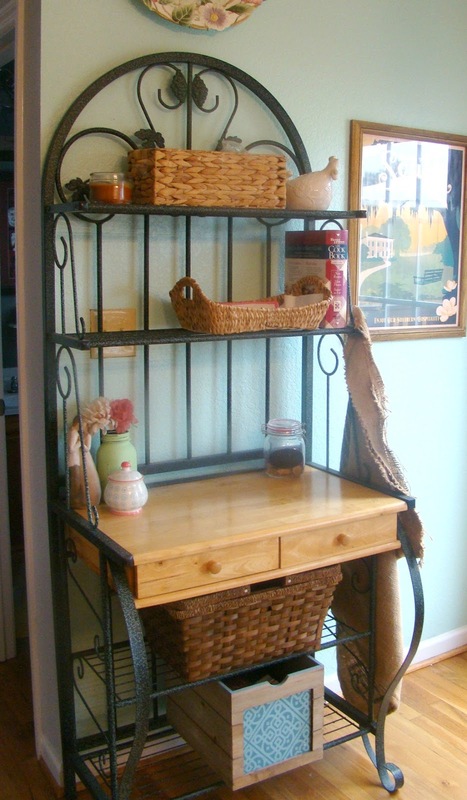 And here I added more rustic open shelving above it. 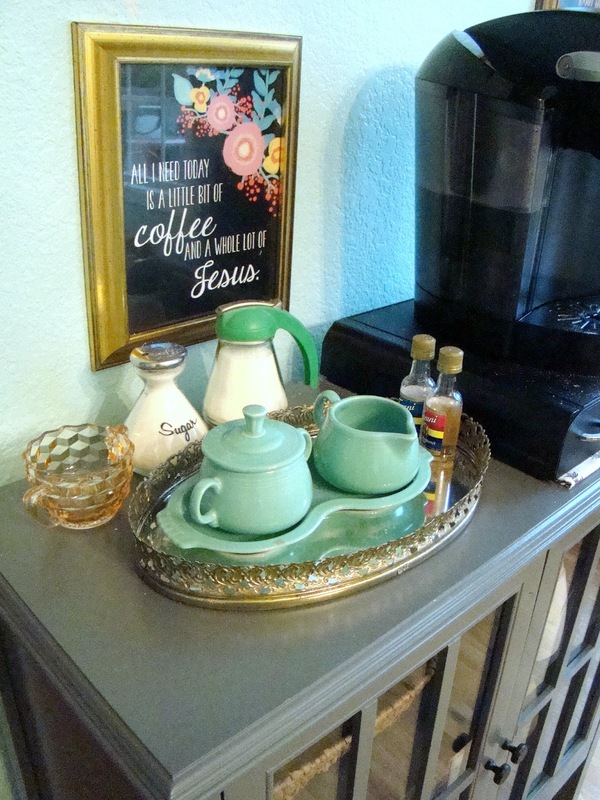 I moved my Coffee and Jesus print from the other gallery wall to over here, and added a metal basket to hold our extra K-cups. There's plenty of space inside to hold extra coffee mugs, my cook books, and a crate full of random crap I don't want anyone to see stuff. And we can reach the light switch! Look at these antique store goodies I found to hold our creamers! I've always loved the vintage syrup pitchers! We are really enjoying having all of our coffee supplies in an easy to reach place (maybe too easy to reach for the three year old! ), especially since we drink coffee all day long.